Protestors were out in force before a City Planning Commission hearing in Greenwich Village on Wednesday, to show their opposition to the rezoning of Lower Manhattan. "Chinatown? Not for sale. Lower East Side? Not for sale," chanted the crowds. The rezoning proposal before the CPC covers 111 blocks, running north of Delancey Street to East 13th Street and east of the Bowery to Avenue D.
For the first time, height limits would be put on buildings within the zone, which has recently become home to several luxury high-rises. But residents outside that zone fear that plan would leave their neighborhood defenseless, with many at risk of losing their homes to over-development. "They're pushing for it, our rezoning plan for Chinatown and the Lower East Side,” said Jei Fong of the Coalition to Protect Chinatown and Lower East Side, “that's basically going to cut out and up-zone all the areas of people of color and create massive displacement." Protestors say they have been left out of the planning process, but the commission insists there were many opportunities for people to speak up. "We've had meetings that were open and publicized and advertised to everybody. Anyone was welcome to come,” said City Planning Commissioner Edith Hsu-Chen. “So frankly, those allegations that we've had closed meetings are absolutely baseless." But the residents who went from protesting outside in Washington Square Park to yelling at the commissioners in the meeting described their review process as a charade. "Proponents ask us to wait our turn, that we will get our protection under a new plan one to three years from now,” said Malcolm Lam of Coalition to Protect Chinatown. “I say that you [commissioners] should wait. You should wait to ensure equality and fair representation for all people." Some neighborhood residents favor the proposal, flaws and all. "Do we wait for the perfect plan? Do we wait until we get absolutely everything? Or do we take some opportunities right now to serve our community?" said Damaris Reyes of Good Old Lower East Side. The CPC has 60 days to approve or modify the rezoning plan, before it goes to the City Council for a review and another public hearing before a final vote. MONTHS may pass before the city’s planning commission decides on a 111-block rezoning of the East Village and the Lower East Side. That rezoning could allow for larger buildings on the neighborhoods’ major streets. HOUSTON AT PITT STREET A rendering of the Lee, which plans mostly studios. But the connective tissue between the neighborhoods, East Houston Street, is already showing signs of change, as for-sale signs go up and buildings fall — whether because of the proposed rezoning or despite it. The Lee, for example, is a 12-story glass-and-masonry tower rising at Pitt Street on the site of a former boys’ club. Its nearly 100,000 square feet of space will hold 263 rental units, almost all studios. In recent years, rentals on East Houston, like the hulking Avalon Chrystie Place and the Ludlow, have catered to the luxury market. But even if the Lee does have similarly large dimensions, as an “affordable” complex it is intended for quite different tenants. For 105 of the units, the rent will be about $700 a month if the renter moves in from a nearby location and earns no more than 60 percent of the median income, or about $30,000, said David Beer, a director of Common Ground, a nonprofit group based in Manhattan and the Lee’s developer. Applications will be accepted starting in January. There are also 104 apartments reserved for homeless people struggling with mental illnesses. Rents will most likely be a few hundred dollars a month, or 30 percent of a tenants’ income, Mr. Beer said. The remaining 54 units will go to young adults transitioning out of foster homes, he said. The $59 million cost of the project, which will be completed next spring, is being borne mostly by the city and state, according to Mr. Beer. Common Ground has never in its 17-year history built a new facility in Manhattan, but the opportunity comes not a moment too soon, Mr. Beer said. “Most affordable housing is created in outer boroughs, but there’s a critical need in affluent areas as well,” he said. Because the Lee offers on-site substance-abuse counseling and job training, it earned zoning leeway to be larger than a typical new building. That leeway would mostly be preserved for buildings that go up under the new zoning. There would also be a similar stipulation allowing bigger-than-normal buildings for developers who created affordable housing under the same roof, or close by. 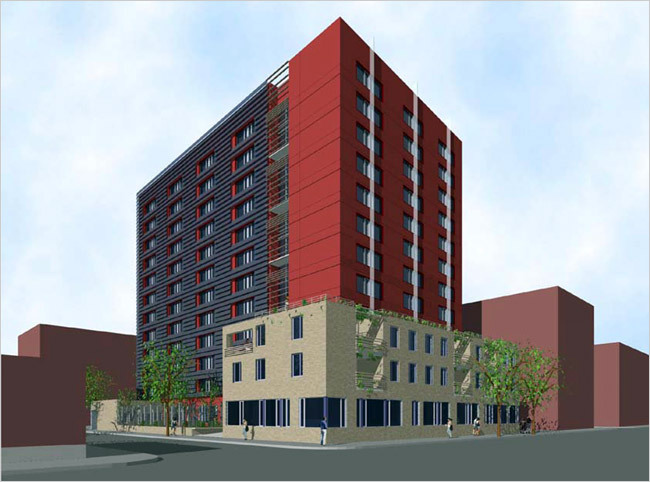 The developers of a proposed 12-story 160-unit apartment at the corner of Avenue D, which was in the demolition phase last week, also hope to avail themselves of this zoning stipulation. 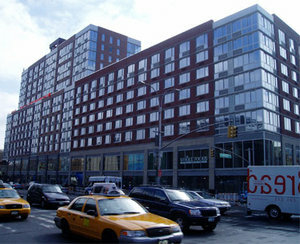 Tony Labozzetta, a spokesman for the as-yet-unnamed project and a principal at Wall Street Realty Capital, which is lining up financing, expressed willingness to include more affordable units than the 20 percent that the new zoning would require — in part to improve the chances of buying an adjacent lot owned by the city. He added that without the rezoning, the project would most likely be dead. While affordable-housing incentives may read well on paper, they are often ineffectual, critics say, especially when they’re not required but optional, as is the case here. “There’s no guarantee it will be built,” said Susan Howard, an activist with the Coalition to Protect Chinatown and the Lower East Side. Ms. Howard said that similar incentives had produced only 600 affordable units in New York in the last 20 years, far fewer than in comparably sized cities. “It hasn’t worked,” she said. Just south of Delancey Street on the Lower East Side, near the bustling entrance to the Williamsburg Bridge, lies that rarest Manhattan commodity: vacant land. This is not just a few buildable lots, but a huge swath of property, some five acres in all, every square inch of it owned by the City of New York. It is a fabulous parcel, the kind that developers—like those building theswanky new towers rising on the other side of Delancey Street—only dream about. The site is in that perfect pre-development stage, with parking lots covering most of its blocks. As the building boom has taught every New Yorker, this is the normal holding pattern for soon-to-be-developed urban land. But not here. These weed-strewn lots have stood for more than a generation, their grim chain-link fencing, topped with barbed wire, all that passes for a streetscape. No one has dared break ground here in decades. Every promise to do so, every initiative that might bring new construction, has been buried by the political masters who control this barren turf. Even today, as Mayor Bloomberg insists that he must add 65,000 affordable homes to meet the city's housing crisis, this stretch of land—the largest chunk of vacant city-owned property south of 96th Street and the most logical spot to build low-cost dwellings—remains off the table, a political untouchable. Who has such clout? Who tells a mayor, an entire city, to simply buzz off? Who else but that wily old pol, Assembly Speaker Sheldon Silver. This strip—carried on zoning maps as the Seward Park Urban Renewal Area—is the northern edge of Silver's lower Manhattan district. And while he rarely leaves fingerprints, nothing moves here without his approval. In Albany, where he is the state's second-most-powerful figure, Silver is notorious for his often-obstructionist ways. On Seward Park, he has outdone himself. Under his watch, this territory has remained desolate and empty for more than 30 years, held hostage to stubborn prejudice and fear of change. Silver declined to discuss his role. But he issued a statement insisting that he's blameless and calling for "a locally driven process" to develop plans for the site with all "stakeholders" participating. He also praised his own record of promoting affordable housing. Classic Silver. Consider the facts: In 1967, the city cleared the last of some 2,000 residents and nearly 400 small businesses from the site. This was urban renewal at its destructive peak, demolishing tenements and evicting longtime residents with the feeble pledge that public good and betterment would result. Once new housing was constructed, residents were assured, they'd be first in line. Like most inner-city urban-renewal sites, minorities got the bulk of the eviction notices: Two-thirds of those moved off the land were black and Latino; one-third were white. "We lived right over there," Nilda Rivera, 69, was saying the other day, standing in the shade of a lone tree on Broome Street and pointing east toward Attorney Street. "There was me, my four cousins, my aunt, and my uncle who was in the Merchant Marine." That was 1952, when Rivera's family in Puerto Rico sent her to live with relatives. When her mother and four siblings arrived a couple of years later, they took an apartment on nearby Norfolk Street. It was a fourth-floor walk-up without hot water. The tub was in the kitchen, the toilet in the hall. Was there a tiny balky refrigerator or just an old-fashioned icebox? 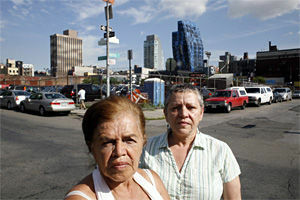 The memories of Rivera and her sister Lillian Rivera, 58, standing beside her, differ. But both recall a mixed neighborhood of Jews, Poles, Irish, blacks, and Hispanics where people looked out for each other. "One day I played hooky, went to the park," said Nilda Rivera. "I came home, my mother says: 'So, how was the park?' This old Jewish lady next-door had seen me and told my mother." Lillian Rivera pointed to a spot on Norfolk Street adjacent to a closed synagogue where Harry's candy and soda store had stood. "There was a Polish grocery, a wedding hall, a Romanian restaurant, Mr. Brown's bar. We lived here so many years. It's where I made my friends. I shopped in la marqueta," she said, gesturing toward the Essex Street Market a block away. Initially, they were told the land was needed for a new expressway, one of Robert Moses's schemes. When that failed, the city said it would rebuild on the site. The Riveras, with nowhere else to go, were the last out of their building. While they waited, the streets became a drug mart, dealers hawking their wares as customers cruised past. It wasn't all desolation. To the south, along Grand Street, rows of new high-rises sprung up, built by unions and nonprofit groups. The buildings were middle-income co-ops, with low purchase prices. Those apartments were quickly taken by garment workers and others, many of them Jewish. Blacks and Latinos somehow didn't make the cut. "My mother was a single parent working in a factory," said Lillian Rivera. "Whatever it cost to get in the co-ops, she didn't have it. We were excluded." A lawsuit alleging discrimination by the co-ops lingered in federal court for years before a settlement opened the rolls in the late 1980s. The Riveras and other former residents kept waiting. "We always had that dream that the neighborhood would come back," said Lillian Rivera. Every city administration has made a stab at resolving the situation. Back in April 1980, Ed Koch proposed a shopping center, 150 units of housing for senior citizens, and a modest 100 apartments for low-income families. A near-riot ensued at the old Board of Estimate. Residents of Grand Street shouted down speakers from north of Delancey. Taunts of "racist" and "criminal" flew. Andrew Stein, then Manhattan borough president, shot down the plan: "Every experience with low-income housing," he said, playing to opponents, "shows it creates crime and social problems." Silver was then a two-term assemblyman from the co-ops. The Rivera sisters recall him as a bright young lawyer. Nilda Rivera, a social worker at Gouverneur Hospital on Madison Street, found him "very helpful with our clients." But he went stony deaf when the subject of Seward Park arose. "I am so disappointed in him," said Lillian Rivera. A couple years ago, the Bloomberg administration floated its own modest proposal, calling for a mix of low- and middle-income housing, along with more units for senior citizens. This one never made it to City Hall. Administration officials quietly dropped the plan after another raucous hearing, this one at a local community-board meeting. Lillian Rivera, a retired public-school teacher, tried to speak over the shouting: "These people were saying the new housing would devalue their property. I said, 'I was here before you were. I was your neighbor, remember? You'd see me in the supermarket? Now, all of a sudden, I'm not good enough to come back to my own neighborhood?' They booed me off the stage, but at least I got my say." These days, the Bloomberg administration lapses into cautious bureaucrat-speak when pressed about the site: "There is a long history of underdevelopment, with great community interest," says a spokeswoman. "The city is interested in re-engaging and discussion about future uses. The community will be fully involved in any dialogue." Pushing hardest for that discussion is a group calling itself the Seward Park Area Redevelopment Coalition. A year ago, Harriet Cohen, the group's chairwoman, wrote Silver requesting a meeting. "We never heard back," says Cohen. A lot of accusation in that article -- but no hard info regarding who and what Silver has actually influenced. I thought that too, but something is holding it up. Is this the site in question? "Why don't they develop this godforsaken expanse of parking lots near the Williamsburg Bridge. Hard to believe this is Manhattan". It's Silver. His acolytes in the coops behind the lots have blocked anything with a below-market component. The affordable housing advocates have also been at fault, with demands that the site be filled with mostly moderate and lower income folks. HPD needs to get both sides in a room and hammer out an agreement. Eventually, I think something will be built that resembles the Cooper Square/Avalon Bay site. It had a similar set of issues that were eventually resolved to at least an acceptable compromise for all sides. If it's going to be more like that Avalon Chrystie, then I say let it remain parking lots. At least with parking lots, it can always be redeveloped in the future when there's better vision and design enlightened mindset in the city. I fear you'll be waiting an awful long time for that to happen. Another Hotel for Orchard Street? YES. Orchard Street—proud, history-laden Orchard Street—should seriously consider having its tubes tied. The block still hasn't healed from birthing the Thompson LES luxury boutique hotel, and across the street, the Orchard Street Hell Building continues to ravage its surroundings. And while the Lower East Side has many other hotels in various stages of planning, it's safe to say that Orchard Street probably doesn't need any more of them. Oh well! The building at 163 Orchard Street, between Stanton and Rivington, was recently torn down, and Department of Buildings records show that a 10-story, 32-room hotel is planned for the site. We're not sure how the 107' height of the building meshes with the pending LES rezoning, but the developers might not be concerned: architect Ramy Isaac, a guy who knows a thing or two about massaging building codes, is named on an application. As you'll see after the jump, construction is in its early stages, but neighbors are already on edge. A pair of complaints logged on July 22 stated that construction activity was causing neighboring buildings to "wobble and vibrate." One person even felt the need to tell the 311 operator that his clock had fallen off his wall. Hey, time flies when you're having fun! "Money is a part of life, even in the life of the church. ... This summer’s recession with sharp increases in food, fuel and other needs is shaping up to be one of the worst I can remember. Despite the government’s attempt to bolster the economy by sending us all economic incentive checks in the form of tax-rebates, tithes and donations are still very low. One person did send a special donation from their rebate check in addition to their regular tithe to the Cathedral—just one person— so far." "We are currently working on an opportunity that could provide us with a clear way out of the morass of financial problems that have plagued the Cathedral for decades. This plan has a purpose, a sense of duty to the past and future of the Church, and an eye toward future preservation while taking into account the best interests for our parishioners. Should this opportunity develop beyond the exploratory phase our pledging members will be asked to approve it." We think we may know what that opportunity is. The church today filed plans with the Buildings Department to erect an eight-story, 34-unit residential building at 59 East Second Street, the address of the church, which, while quite pretty, does not appear to be landmarked. It's unclear at this point whether the apartment building would rise atop the church, behind it, or in place of it. Church representatives were not immediately reachable, but we'll keep you posted. If it were an addition wouldn't it be an A1 permit and not a NB. However the permit says 8 stories and 141', so something is unique about the project. Perhaps they are saving the facade and constructing the new building behind. If this building is razed, it demonstrates further how f...cked up NY is. The "developers" nads should be cut off.